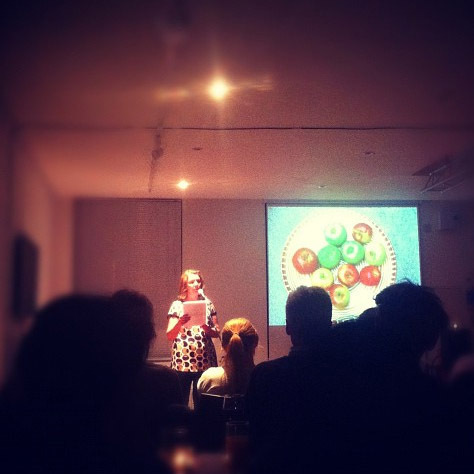 Last Friday I was one of the presenters at Pecha Kucha Night at the Lighthouse in Brighton. If you’re not familiar with what it’s all about: Pecha Kucha (or PK for short, let’s say) apparently approximates to the Japanese for ‘chit chat’, and it was devised by a firm of american architects based in Japan, who were fed up with having to sit through long, rambling ‘creative’ meetings that went nowhere. So PK is a short format for giving presentations. You have to use 20 slides (no more, no less) and each is shown for exactly 20 seconds. The slides move on automatically and the entire presentation lasts 6 minutes 40 seconds. No chance of over-running or boring anyone! PK Nights happen all over the world, and they consist of 10 or so presenters who each have a chance to talk about something they’re interested in, to anyone who will listen. The evenings are run by people from the creative community, not-for profit, and the topics tend to be wide-ranging, often fascinating and sometimes hilarious (it’s pretty informal). Last week we had talks on the man who discovered how to treat diabetes with insulin, an impassioned plea to invade the Isle of Man, a talk about teaching animation to kids and plenty other thought-provoking stuff. My contribution was a bit different in that it was more of a performance and less imparting information. I showed twenty photos by the fantastic Simon Dale, and wrote 3 short narrative poems to go with them, which I read out. (I did a similar thing at a previous PK night a few years ago). I really enjoyed it – it makes a change from just giving a reading and the addition of the photos adds another layer of interest. I had some nice comments afterwards which was great. I don’t expect it was everyone’s cup of tea, but I like the idea of introducing new audiences to poetry in a subversive way – and if they didn’t like the words at least they had some lovely pics to look at! Thanks to audience member Jonathan who took the photo I’ve used here.